Swinging on a tire. Walking in nature. Playing a game of follow the leader. Exploring the back-yard is always loads of fun. This series offers five important lessons--about God's Word, God's love, Jesus' example, Jesus' friendship, and the plan of salvation--to help young people enjoy exploring the Bible. Psalm 33:4 tells us "For the word of the Lord is right, and all His work is done in truth." 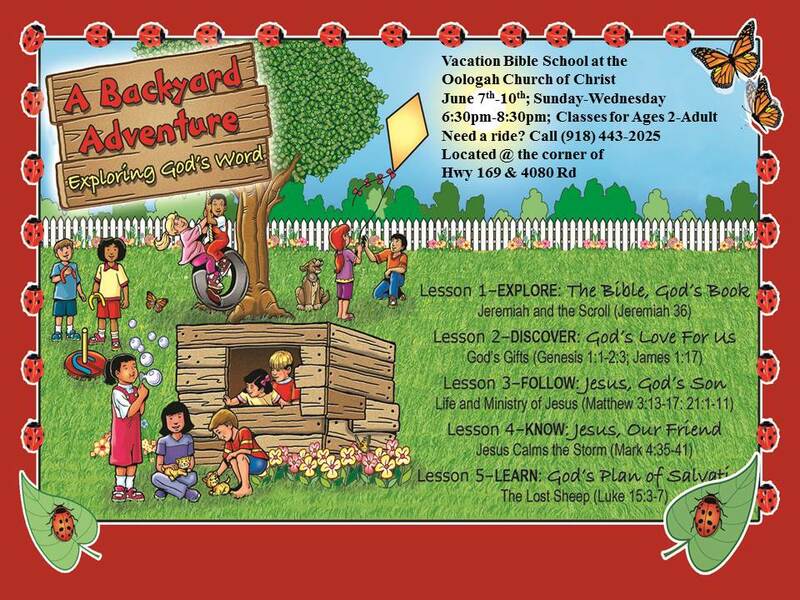 A Backyard Adventure will have your students searching the Bible to learn God's plan for their lives. This years VBS will begin on June 7th and end on June 10th. The classes will begin at 6:30 PM and end at 8:30 PM. If you will need a ride or know of someone that will need a ride please call the church building at 918-443-2025. Aim: To learn that the Bible is from God and it will last forever. Aim: To learn that God showed His love by creating the world and giving us everything we need both physically and spiritually. Aim: To help students learn about Jesus' life and ministry and how to follow the example He left for us. Aim: To teach the students that Jesus is their friend and how to be a friend to Jesus. Aim: To teach God's plan for saving the lost so students will want to be children of God.